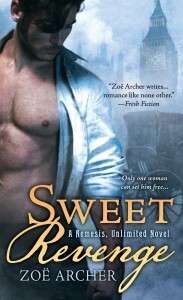 Award-winning author Zoë Archer returns with another novel of breathtaking suspense as Nemesis, Unlimited schemes to avenge injustice…and conquer a woman’s heart. From the exterior, Devere’s lodgings on Aberdeen Road appeared perfectly respectable. Potted plants flanked the doorway of the terraced house, and the brick façade looked regularly scrubbed of the city’s ubiquitous coal smoke. Though bachelors lived within, curtains hung in most of the clean windows, revealing that the men might be single, but they still took pride in their home. Or the lodgers paid a charwoman to come in and tidy everything up on a regular basis. The building was respectable, but Bronwyn and Marco’s purpose wasn’t. She kept glancing over her shoulder as they climbed the front steps, certain that the passing pedestrians could see their criminal intent hanging over them like a dark miasma. “The more suspicious you look, the more people have a reason to suspect you,” Marco muttered as he escorted her up the stairs. As Marco had predicted, the front door to the lodging house was unlocked, and he opened it confidently. They stepped into a carpeted foyer, with a hallway just beyond it, and doors presumably leading to flats off the hallway. The carpet showed wear from the tread of numerous men over the years, the bannisters on the staircase rubbed to a shine from countless hands, but like the front of the building, everything seemed neat and cared for. She allowed him to lead her up the steps, even as her heart beat in her throat. She wasn’t certain what she’d say if anyone caught them there. The landlord could throw them out, or, worse, summon the constabulary. “Is that how you justify it?” she asked. They didn’t pass anyone in the stairwell, the whole building resonant with the silence of men away at their offices. Finally, they reached the third floor, and Marco walked directly to one of the two doors off the landing. He tried the doorknob. Locked. 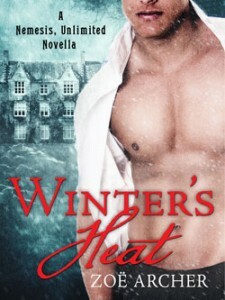 “Now we go inside.” From within his coat, he slipped a slim leather case and flipped it open. He manipulated words to absolve himself of wrongdoing, sending a tremor of unease up her spine. Just what did he do when he wasn’t working for Nemesis? Likely he had to pick more than a few locks for the organization’s missions. Still, something about the ease and artistry of him at the lock…he had a skill that went beyond Nemesis’s needs. She’d read the sensationalized tales in periodicals about blackguards, scoundrels, even highwaymen from long ago, and found those stories…interesting. Faintly titillating. The sight of Marco now gently easing picks in and out of the lock made her heart beat harder—and not with fear. Heaven help me, I’ve turned into a reprobate, aroused by the sight of a man breaking into another man’s home. Her reverie broke when she heard the front door downstairs open. “Oh, hurry,” she whispered urgently. Yet before the last syllable left her mouth, Marco had turned the knob to Devere’s flat, revealing the rooms within. They stepped inside quickly, with Marco shutting the door noiselessly behind them. For a moment, they paused, waiting. But there were no hasty footsteps on the stair. No calls for them to quit the premises immediately. She exhaled. They were safe. And she’d just participated in her very first criminal act. “My feet can hold me, thank you.” She exhaled. He appeared entirely unperturbed as he gazed with perceptive eyes around Devere’s rooms. Bronwyn tried to see what he saw. There was a front parlor with a small stove in one corner, and beyond that, a bedroom. The furnishings were of decent but not extravagant quality. Though the curtains were open, a heaviness lingered in the air. “No one’s been here for some time.” She wrinkled her nose at the musty atmosphere. “A month at least,” Marco said. “Maybe more.” He moved through the rooms, quietly opening cupboards and poking behind furniture. “Documents, notebooks.” He pulled open the top drawer of a writing desk, removing a sheaf of paper. This he set on the parlor table, and continued to prowl through the room. Bronwyn moved past him and into the bedroom. Her skin tightened to be in a stranger’s bed chamber, and a man’s, at that. But there was more at stake than propriety. The bed itself was unmade, and when Bronwyn opened a chest of drawers, she found only a few shirtfronts. Everything else had been cleared out. He spoke with such assurance, she couldn’t doubt him. There was another, smaller desk in the bedroom. She discovered a notepad, but the paper inside was blank. Still, she tucked it into a pocket in her cloak. It might prove useful somehow—though she doubted it. Sudden inspiration struck her, and she knelt beside the bed. She lifted up the mattress, and gave a little cry of excitement when she uncovered a portfolio. Grabbing the folder, she took it out to the parlor. Marco stepped close as she undid the portfolio’s cloth tape fastening ,then opened it. He started to laugh, and she fervently wished the myth of self-immolation was true, because she’d never been more mortified in her whole life, and that included the time she appeared at a debutante ball with her skirt tucked into her bustle. The portfolio held photographs. More specifically, pornographic photographs. Men and women tangled in numerous configurations, some of them downright gymnastic. She wanted to slap her hands over her eyes, or turn away, but she couldn’t. Her gaze remained fastened to the pictures. “Can’t they?” he murmured. He picked up one particularly appalling/intriguing picture where a man held a woman up against a wall, her legs wrapped around his waist, the couple enthusiastically…coupling, if the blurriness of the photograph was any indicator. “This one’s always been quite fun.” He dropped it back into the stack and moved on in his search of the room. “I might’ve,” he said over his shoulder as he rifled through another drawer. Now she was absolutely certain she would burst into flames. It was impossible to look at him now and not imagine him doing those filthy, wonderful things in the pictures. And he was so clever, he could come up with many more variations. Intelligent men had always intimidated and intrigued her—but this added a whole new dimension to what a quick-witted man might be capable of.